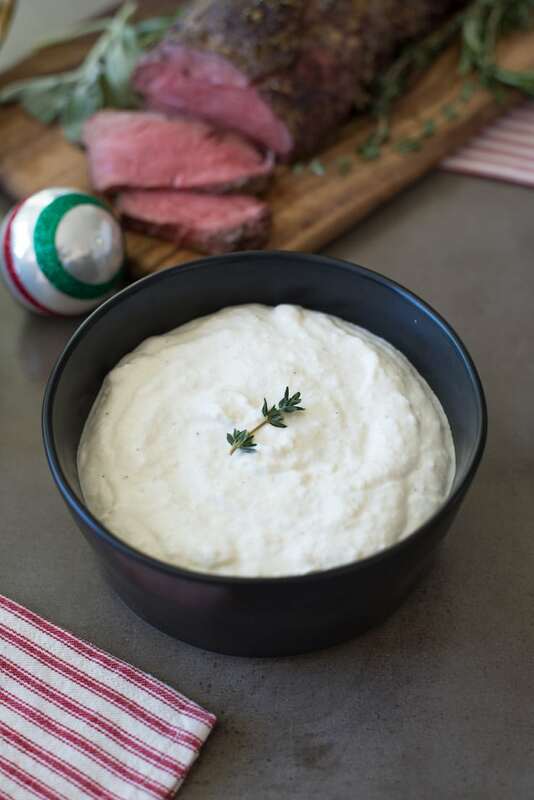 Herb Roasted Beef Tenderloin is the perfect family favorite for your holiday dinner. Coated in fresh herbs for maximum flavor. Roasted to tender perfection all you have to do is serve with all your favorite sides and they’re all right here. If you find that you just can’t face turkey again for the Christmas holiday, never fear beef tenderloin is here to save the day. This is recipe #2 in this weeks complete holiday meal. 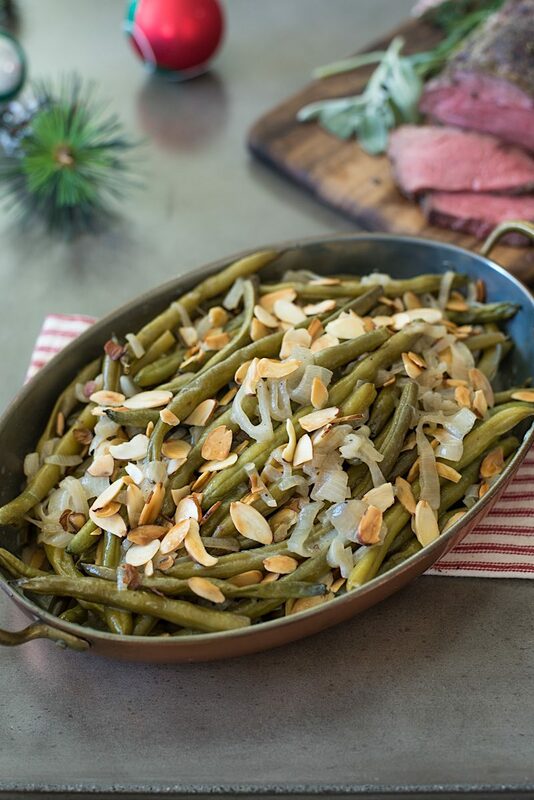 Slow cooker green beans with shallots and almonds was posted yesterday and look for the creamy horseradish sauce that I served over the beef, it is so good! And a cheesy mashed potato casserole. You will find these posted every day until Thursday of this week. 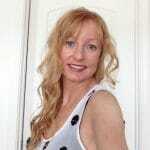 Links are also below. Beef tenderloin is basically a giant filet mignon that feeds a crowd. This 5 pound tenderloin will feed 13 people, at 6 ounces per serving. If you’re not feeding 13 people, enjoy the leftovers! Tie the tenderloin before roasting? When you buy your beef tenderloin, it may come untied. What do I mean? If you see in the video below, I tied the tenderloin with kitchen string to keep it shapely and tight as it can be floppy and any thin ends can be tucked in. This way it will roast more evenly. If you are not comfortable doing this, ask your friendly butcher to do this for you. To help the herbs to stick to the meat, I coated it in a mix of butter and Dijon mustard. The butter is for the fat (tenderloin is lean) and the Dijon for flavor and both act as the glue. To cook this tenderloin to your desired temperature, you will need a meat thermometer. I love my digital thermometer because it does not get more accurate than that. 130-135°F/55-58°C for medium rare, 140-145 °F/60-63°C for medium, 150-155°F/65-68°C for medium well. This may be one of the best beef tenderloins that I have made. It turned out so buttery and tender, there was no need for a knife, I ate it with a fork. 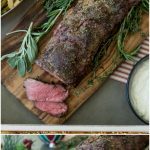 If you’ve tried this Herb Roasted Beef Tenderloin or any other recipe on the blog then don’t forget to rate the recipe and let me know how it turned out in the comments below. I love to hear from my readers! Coated in fresh herbs for maximum flavor, this beef tenderloin is roasted to tender perfection and serve with all of your favorite sides. Remove the tenderloin from the fridge and any packaging and leave at room temperature for 1 hour. Set a rack inside a baking sheet. To a bowl add the softened butter and Dijon, mix well. Rub this mix all over the tenderloin. To a small bowl add the salt, pepper, rosemary, sage and thyme, mix well. Sprinkle the spice mix evenly all over the tenderloin, pressing it into the mustard. Place the tenderloin onto the rack and roast for 30 minutes. Turn the temperature down to 350°F/177°C and cook until internal temperature reaches 130-135°F/55-58°C for medium rare, 140-145 °F/60-63°C for medium, 150-155°F/65-68°C for medium well. Allow to rest for at least 30 minutes after removing from the oven before slicing. I’ve pinned the recipe but it doesn’t say in it when to coat with the herbs, before roasting or after? I would assume after u rub with butter mustard mixture. The herbs get mixed and coat the tenderloin after the mustard is added. I’ve edited the recipe to make this clearer. If you make this, please come back and leave a comment about how it turned out for you. I made this last night as a practice for our holiday meal and it turned out really well. It was so easy and really tasty, the combo of herbs are perfect. I’m not a mustard fan, but i liked it on the beef. Next time I’ll make the horseradish sauce because my husband wanted it. That is a great and valid point you make about trying a recipe BEFORE you make if for the holidays. I’m glad it worked out for you and I can’t have the beef without the horseradish sauce, I think you’ll really like it.